STOCKTON, CALIFORNIA (February 12, 2019) – Financial Center Credit Union has renewed its sponsorship of Delta Speedway heading into the 2019 season, with action fast-approaching at the Delta Speedway presented by FCCU. The 33rd year of racing on the 1/7th mile dirt oval at the San Joaquin Fairgrounds opens March 17th with a non-points event. Super 600, Non Wing, Restricted, and Jr. Sprints will be represented all season long in battles for $1000 championships. FCCU’s partnership allowed Delta Speedway promoters Bob & Tiffanie Panella to bolster guaranteed purses to $500 to win for Super 600 and Non Wing, $300 for Restricted, and $200 for Jr. Sprints in 2018. Those guarantees return in 2019 and should continue to attract the top Micro talent from across the world to the speedway. The Panella family is embarking on their sixth year at the helm of Delta Speedway and the first of a five year extension. The 2018 season at Delta Speedway not only had great purses, it also featured great car counts with a 98 car average per race event including the non-points races. 14 points events and three special non-points races make up the calendar. The non-points rounds kicks off with the season opener on Sunday March 17. Delta Speedway serves as a key part of a weekend of World of Outlaws Sprint Car action that includes the adjacent Stockton Dirt Track. A play day will follow on March 30th before the points season opens on April 6th. 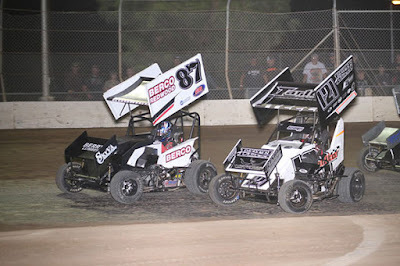 The 2019 Hoosier Tire California Speedweek visits Delta on June 26 as part of its four races in five nights jaunt, and Turkey Bowl XIX caps the season October 25 and 26. Two of the most popular events at the track are the Summer Sizzler and the Dual at Delta, which each give drivers two complete nights of points racing on a single weekend. The Sizzler will be Friday and Saturday June 15-16 during the San Joaquin County Fair. The Dual runs over Labor Day weekend on Saturday and Sunday August 31-September 1. Defending track champions include Nikko Panella in Super 600, Tj Smith in Non Wing, Caeden Steele in Restricted, and Dalton Parreira in Jr. Sprints. Delta Speedway presented by Financial Center Credit Union also thanks Starr Property Management, Lovotti Air, Van De Pol Petroleum, and Performance Electronics for their support. Additional class and winners circle sponsors still available!